Google is known to support its campuses and employees with some pretty off-the-wall transportation; take this unusual seven-seater conference bicycle. Now, the company has its own monorail. Well, two decommissioned carriages anyway. It’s a kooky move, but one that has a memorable and hilarious story at its core. Paul Cowan, a site reliability engineer at Google, originally requested – as a joke – that the technology giant buy and install the iconic Sydney Monorail. The idea was submitted to Google’s internal ticketing system, which is used to identify maintenance and repair work needed in its Australian offices. A member of the Facilities team, Alecia, then responded to Cowan’s ticket, giving a reportedly witty retort as to why purchasing a monorail simply wasn’t viable. The story then exploded within Google, doing the rounds for about a week. It gained “legendary” status and no-one thought more of it. Three months ago, Alecia then called Cowan into her office. Google, being Google, has decided it wanted some monorail carriages in its offices. “Alecia takes us out to a junkyard near the airport, and we all help choose which two monorail carriages we want to purchase and install as meeting rooms in One Darling Island, our new workspace in Sydney (the aforementioned rumoured third building),” Cowan recalls wistfully. Fast-forward to Tuesday, October 8. 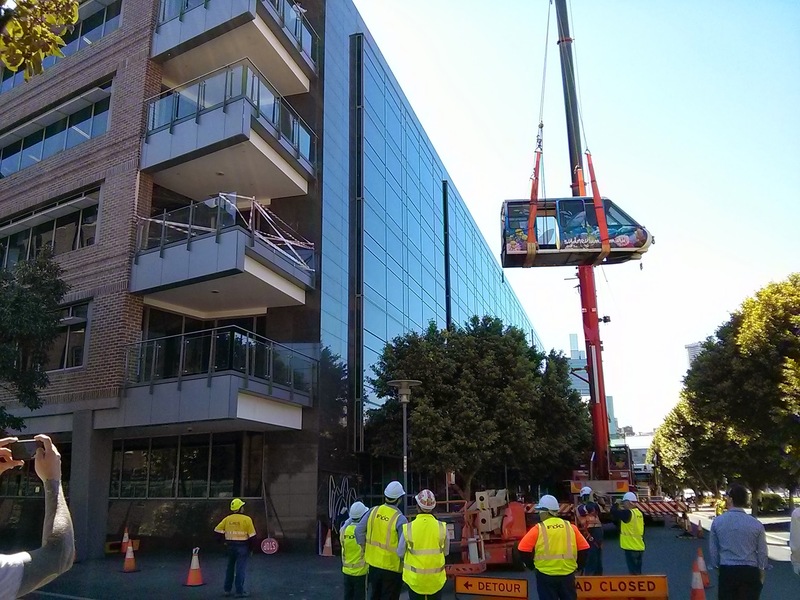 A huge crane lifted the two abandoned carriages into Google’s offices through a second-storey window, where they will now be used as unorthodox meeting rooms. The Sydney Morning Herald estimates that it cost Google around $250,000 to transport and install the carriages. A sizeable sum, but one that’s arguably offset by the bizarre and downright awesome reputation that Google has just created for itself. You know, if it wasn’t barmy enough for creating self-driving cars and Internet-equipped balloons.